Despite the much-publicized special relationship of U.S. President Donald Trump with Japan’s Prime Minister Shinzo Abe, who have met about nine times (and shared three rounds of golf) since late 2016, Trump’s policy agenda on trade and North Korean dialogue signals a disquieting uncertainty in the U.S.-Japan security alliance. Separating increasingly fraught economic talks from the security architecture seems likely to be Abe’s best political strategy in making sure Tokyo’s interests are not sidelined by “making America great again”. During Trump’s era, the form and context of the long-standing U.S.-Japan partnership, the cornerstone of Japan’s national defense since the 1960s, appears to be facing new strategic challenges. In spite of Abe’s exceptional success in dealing with Trump’s eccentric character, Tokyo has been taken aback by the unprecedented stress surrounding its great friendship with the U.S. government and appears to be having difficulties in managing the alliance. As the current administration becomes increasingly more illiberal and unpredictable while favoring the “America first” agenda, the growing distrust of Trump’s presidency among many Japanese officials has urged Prime Minister Abe to step up to the mark in order to preserve and reinvent the rules-based world order. The seeming absence of a shared strategic vision implicates not only the prospects for upholding the postwar international system and principles of multilateralism, but calls the very future of Japan’s U.S.-led security architecture into question. 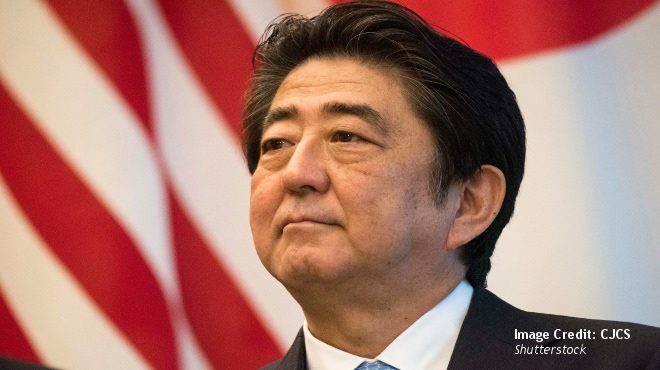 In spite of Japan’s increasing role in international affairs and close ties with the current U.S. administration, Abe observes Trump’s presidency with a diminishing optimism. Irrespective of his personal rapport with the president, the leader’s silence on Japan’s regressing economic relations with the U.S. at the Washington bilateral talks preceding the G7 summit, shows Abe’s commitment to bridge the widening gap between defending Japan’s economic interests and sustaining U.S.-Japan alliance. Although Japanese officials demonstrate a clear understanding of American concerns, they have been patiently trying to persuade President Trump and his administration to reassess the root cause of the U.S. trade deficit, as Japan remains the only U.S. ally that did not obtain an exemption from the recently imposed steel and aluminum tariffs. Moreover, President Trump has additionally threatened to impose tariffs of up to 25 percent on vehicle imports which would have a critical impact on Japan’s survival in the U.S. all-out trade war. Following the abrupt U.S. withdrawal, Japan took lead in the Trans-Pacific Partnership (TPP-11) trade deal negotiations and became the second member to ratify the revised agreement. TTP-11 covers more than 13 percent of the world economy, so Tokyo’s move to considerably slash tariffs signals their determination to promote free trade amidst protectionist trade policies coming out of the U.S. Most recently, the Japanese leadership successfully demonstrated its efforts in championing open trade with the historic conclusion of the EU-Japan Economic Partnership Agreement (EPA). The terms of the EPA account for a third of the global economy and eliminate the vast majority of tariffs imposed on bilateral trade. This was a move that came not least in defiance of President Trump’s tariff policies against what he perceives as unfair trade practices. Japanese focus on trade liberalization will now most likely shift towards the Regional Comprehensive Economic Partnership (RCEP) leadership, a free-trade agreement within the Association of Southeast Asian Nations (ASEAN) framework that will also include Australia, China, India, Japan, New Zealand, and South Korea. At a time of increased tensions, Trump might resort to an identical confrontational approach toward U.S. security commitments overseas, as already seen in South Korea and NATO. Japan would then have no choice but to rise to the challenge and take on a more independent, assertive approach to national foreign policy. The Trump-Kim Singapore summit, the first face-to-face meeting between a sitting U.S. president and a North Korean leader, was a significant wake up call for Japan and a very clear signal of America’s Japan-neglecting diplomacy approach. Although observers note the U.S.-North Korea denuclearization agreement appears to be thinner than many expected, Trump’s unpredictable foreign policy course took even Seoul by surprise, as it unilaterally halted the U.S. military exercises in South Korea in concession to the Pyongyang regime. Having explained to the U.S. regional allies that backing from such a provocative move would additionally save a tremendous amount of American money, Trump and Kim might eventually strike a more substantial deal, leaving the Japanese behind closed doors. Following Japan’s departure from the U.S.-dominated economic policy, the country now seeks to boost the official exchange with China and seek rapprochement in its relations with Russia (which is currently poisoned by the Kuril Islands dispute and the technical absence of the Second World War peace treaty). Yet with the Russo-U.S. relationship unsettled, it is uncertain how far Tokyo’s reconciliation with Russia will go. Encircled with North Korean deployment of nuclear weapons, Chinese military influence in the South China Sea, bitter territorial disputes, and unresolved historical grievances, the Abe cabinet is inherently unable to distance itself from the U.S., the only domestic ally so deeply involved with Japan’s national defense. Unlike most European countries, Japanese officials face no other option but to come to terms with the U.S. disruptive policy towards Japan and make the most out of Washington’s current re-engagement with diplomacy, such as the long-standing abduction issue with North Korea. Abe’s growing unease over American economic diplomacy has encouraged him to take on a more independent, assertive policy toward transformative security reforms, e.g., boosting the defense spending, enacted to project Japan’s fundamental role in the region. Regardless of the challenges the alliance faces today, structural conditions, close economic and geopolitical linkages as well as shared values and security threats communicated within the context of Japan-NATO strategic parallelism will likely safeguard the future of the U.S.-Japan security commitments and endure the eccentric presidency of Donald Trump in the years to come.